What is a normal umbilical cord blood gas level? As soon as a baby is born, the medical team usually draws blood from the baby’s umbilical cord artery. This blood is analyzed to determine if there was a complication shortly before or during delivery that deprived the baby of oxygen. Oxygen deprivation (birth asphyxia) can cause brain damage, hypoxic-ischemic encephalopathy (HIE), periventricular leukomalacia (PVL – usually seen in premature babies), intraventricular hemorrhages (brain bleeds) and lifelong conditions such as cerebral palsy (CP), seizure disorders, intellectual disabilities, and developmental delays. Normal umbilical cord blood gas values are listed below. Note: The “P” in PCO2 and PO2 stands for “partial pressure,” which is how these gases are measured. We have written extensively about umbilical cord blood gas interpretation. The key point for parents to know is that pH and BE/BD are the main values examined by the medical team. The other values impact pH and BE, but pH and BE are the main numbers examined to determine if the baby suffered from a lack of oxygen to the brain either shortly before or during delivery. Terms associated with oxygen deprivation are asphyxia, hypoxia (decreased oxygen at the tissue level) and ischemia (restricted or reduced blood flow). A pH below 7.18 and a base excess more negative than -8 are indications that the newborn suffered oxygen deprivation. Of course, oxygen deprivation may still have taken place, even if these values are normal. A low arterial cord pH is probably the single most important value used to determine if hypoxia near the time of delivery was severe enough to cause hypoxic-ischemic encephalopathy (HIE). If pH is low, the medical team should be alert to the fact that the baby may have HIE or other forms of brain damage. A pH below 7.18 for a term infant is considered abnormally low, but research shows a strong association between a pH of less than 7.0 – 7.24 and adverse outcomes (such as HIE, intraventricular hemorrhage, PVL, and cerebral palsy) in the baby. pH is the acidity of the baby’s blood. If pH is low, the baby’s blood is acidic, which means that at birth, the baby had an elevated PCO2 and/or an increased number of acidic by-products (mainly lactic acid) caused by anaerobic metabolism. In general, an elevated PCO2 means that the fetus is producing more CO2 than can be eliminated through circulation. In other words, CO2 is not readily diffusing from the umbilical artery and capillaries into the maternal placenta and maternal circulation. High PCO2 is most commonly seen in umbilical cord compression, which hinders or prevents the movement of blood to and from the baby. In cord compression, PO2 will typically be low, and if the compression persists, there will be a progression to metabolic acidosis with an accumulation of lactic acid. When a baby’s cells are deprived of sufficient oxygen, the cells switch from aerobic metabolism to anaerobic metabolism. This is another reason a compressed umbilical cord can cause a low pH/acidic blood: cells don’t have sufficient oxygen to do work in the normal way to meet energy demands (aerobic metabolism), so they switch to using an anaerobic system, which is only supposed to be used for very short periods of time. Lactic acid is one of the end products of anaerobic metabolism, and it can harm cells when too much is produced. Base deficit (a negative base excess) is defined as the amount of strong base that must be added to return pH to normal values. The more negative a BE, the greater the concentration of metabolic components that contributed to acidic (low) pH. The more abnormally negative the base excess, or the larger the base deficit, the more serious the acidosis. The greater the acidosis, the more serious the oxygen deprivation was in the baby (in most cases). Although anything more negative than -8 is considered an abnormally low BE, most research shows that a BE equal to or more negative than -12 (or BD of 12 or more) is a predictor of complications in the newborn. As mentioned earlier, a normal BE/BD and pH do not rule out the fact that the baby experienced oxygen deprivation before or during delivery. There are a number of reasons a baby may have a normal BE and pH but still have experienced birth asphyxia. For example, a baby may have suffered a very severe – even total – oxygen depriving event right before birth (which can occur in cases of complete placental abruption and complete umbilical cord occlusion). In these instances, there may not be enough time for the cardiopulmonary system to reflect the oxygen deprivation that occurred, yet the deprivation could be severe enough to cause brain injury. In other instances, the baby’s circulation and blood flow are so poor that the acid products from anaerobic metabolism do not move through the baby’s body via normal circulation and blood flow. Therefore, they would not be reflected in the umbilical cord arterial blood gas sample. Intracranial hemorrhages (brain bleeds), which can be caused by a traumatic delivery. Forceps and vacuum extractors can cause brain bleeds. Sometimes intense contractions (hyperstimulation) caused by labor induction drugs (Pitocin and Cytotec) can cause head trauma. Mismanagement of cephalopelvic disproportion (CPD), abnormal presentations (such as face or breech presentation), and shoulder dystocia also put a child at risk of having a brain bleed and oxygen deprivation. Anesthesia mistakes, which can cause blood pressure problems in the mother (including hypotensive crisis). Hypoxic-ischemic encephalopathy (HIE) is a form of brain injury caused by oxygen deprivation. HIE can cause the child to have lifelong problems, such as cerebral palsy, seizures, intellectual disabilities and developmental delays. There is a treatment that can be given to a baby who has HIE, but it must be given within six hours of the insult that caused the HIE, which usually means it must be given within six hours of birth. This treatment is called hypothermia (brain cooling) treatment, and it has been shown to halt almost every injurious process that starts to occur when a baby suffers an insult that causes HIE. Research shows that hypothermia treatment can prevent death and cerebral palsy, and it can decrease the severity of the CP. The presence of abnormal umbilical cord blood gas results does not necessarily mean a baby will have a permanent brain injury and lifelong conditions such as cerebral palsy, seizures, intellectual disabilities, and developmental delays. If a baby has HIE, early intervention in the form of hypothermia treatment may help prevent long-term problems. In addition, prompt and appropriate resuscitation at birth (if necessary), proper management of the baby’s breathing, heart rate, blood pressure and circulatory issues, and timely treatment of seizures, hypoglycemia, jaundice and other neonatal problems can become long-term problems. If your baby was born prematurely and has a birth injury such as hypoxic-ischemic encephalopathy (HIE), cerebral palsy, a seizure disorder, or periventricular leukomalacia (PVL), contact the award-winning birth injury lawyers at Reiter & Walsh ABC Law Centers. Our firm is unique in that we focus solely on birth injury law. Reiter & Walsh ABC Law Centers is currently recognized as being one of the best medical malpractice law firms in the nation by U.S. News and World Report, and the partners of the firm, Jesse Reiter and Rebecca Walsh, were recently recognized as being two of the best medical malpractice lawyers in America by U.S. News and World Report. 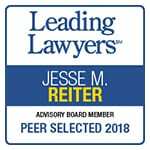 In fact, U.S. News and World Report has given Jesse the honor of being one of the “Best Lawyers in America” every year since 2008. The lawyers at ABC Law Centers are members of the Birth Trauma Litigation Group (BTLG) and the Michigan Association for Justice (MAJ).